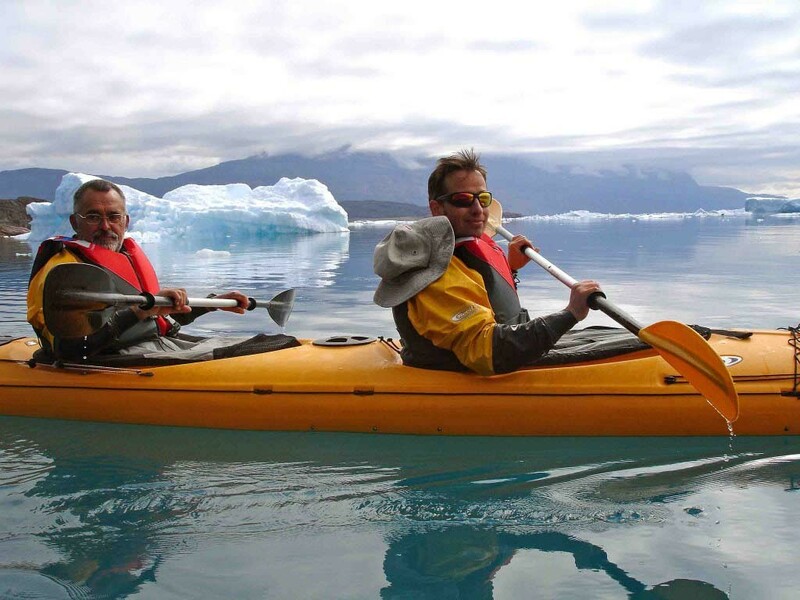 Iceland Greenland kayaking getaway. Five day trip. In three hours we will have leaped from Iceland to Greenland, two contrasting worlds, especially as the goal for this getaway is to take part in a real expedition sailing small kayaks through a sea of icebergs. 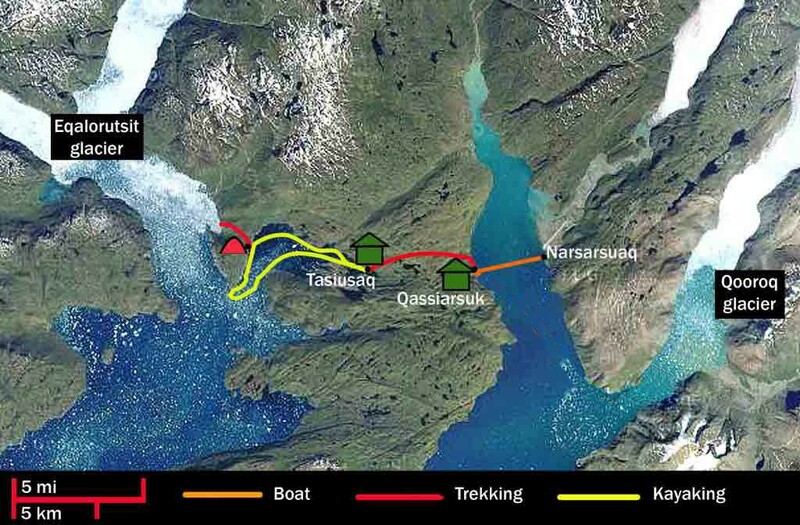 Meanwhile we will have seen the ruins of the first known Viking settlement in Greenland and sailed a zodiac into the bowels of a massive glacier. Independent navigation among icebergs (previous experience in kayaking is not necessary). Possible sighting of seals and visit the ruins of the Viking Eric the Red. Icebergs boat excursion. Experience the endless day (until mid-July) or see the northern lights (from the beginning of August). Three-hour flight from Reykjavík (Iceland’s domestic airport) to Narsarsuaq (south Greenland) with views of Kap Farvel and the southern Greenland sea ice … we are now in the Arctic! Reception at the airport and transfer to the port of Narsarsuaq to cross the Eriksfjord in the direction of Qassiarsuk, a small village of about 50 inhabitants, mostly farmers. Breakfast and, depending on how we see the passage through the ice, we paddle around the western cape of the fjord to get a view of the Eqalorutsit glacier from our kayaks; another option is to heading south to get close to the area of Kangerlua, a farm all year round blocked by ice with landscapes of indescribable beauty. We have lunch during one of the stops before heading off in the direction of Tasiusaq. Boat transfer Narsarsuaq. Once there, we recommend you to visit the Museum of the American Base (the Bluie West One), untouched since the Second World War or you can do which is probably the most renowned excursion in all Greenland, the Flower Valley. Enjoy the spectacular view of a valley formed due to the glacier retreat and the consequent glacial sedimentation with plenty of flowers. If we have time we will walk until we can see Kiattut glacier and the landscape around it, with superb panoramic view of the ice sheet and its Nunataks. Viking reconstruction in Qassiarsuk: high ceilings but cold! Flight from Narsarsuaq to Iceland (Reykjavík Domestic Airport) or to Copenhagen. Departure and return from Reykjavík (Iceland). Since we will be sailing in an area of calm water area and because of the stability of our double kayaks, previous experience in kayaking is not required (although is recommended). The pace of crossing is gentle and a specific physical level is not required.